No one writes better about birds than Nikki Moustaki. To her, the smallest beating bird heart is full of the same strength and longing that is her own. This astonishing book is the story of Nikki’s growth, fall, and triumph, as she seeks to protect every bird in her path, often while not protecting herself. " ﻿I've long been a devotee of Nikki Moustaki's poetry. 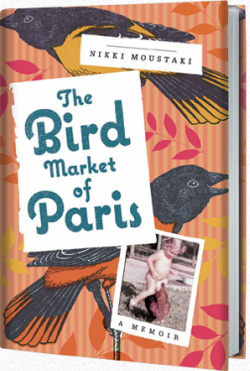 Now, her keen eye, deft language, and startling voice shine just as brilliantly in her memoir, The Bird Market of Paris, a work of remarkable honesty, proving the power and exuberance of her prose. The wisdom of an exceptional grandfather, a passion for birds, and the darkness of addiction—all spun together by Moustaki's gift for finding just the right words, at the right time—give life to this epiphany-provoking gem of a story, skillfully crafted, vivid and rich with feeling." ﻿﻿﻿Through breathtaking, lyrical prose, Nikki Moustaki bares herself on the page, and renders her coming of age and its uncontainable desires through the surprising metaphor of birds. This debut narrative is a stunning, inspiring, honest, break-your-heart recovery memoir with wings, a triumphant story of the brick-by-brick building of sobriety and of family love." 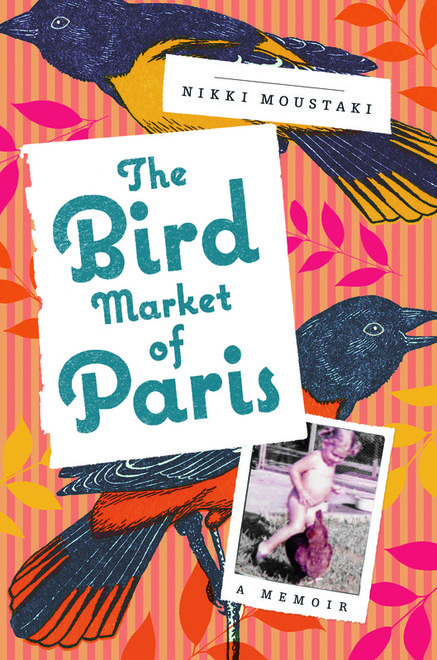 I’ll tell you what’s so good about The Bird Market of Paris, what distinguishes it from the long catalogue of naval-gazing memoirs lining our bookstore shelves. I’ll tell you why it matters. The governing artistic value here is honesty. Nikki Moustaki may want to tell us about her love for and devotion to her Poppy and to her avian friends, and she does a marvelous job at just that, but she tells us something much more important. She tells us about herself and her struggle with alcoholism, her struggle and ultimate victory, and in so doing she tells us all we need to know about courage, dignity, and heroism." This magical memoir tells the story of a young woman, her grandfather, and the birds he introduced her to and (together) they cherish. In the most lovely, lyrical prose, Moustaki takes subjects we think we know all about (fate and freedom, listening and paying attention, substance abuse and recovery, flight and capture, connection and separation, joy and grief, and perhaps most of all, love) and releases us from our truisms, stereotypes, simple formulas, and clichés. It is an honest memoir, a clear-eyed memoir, and in the end, without a trace of sentimentality, melodrama, or false hope, a redemptive memoir. Moustaki is an incredibly gifted writer. Nikki Moustaki, author of The Bird Market of Paris: A Memoir, grew up in 1980s Miami, the only child of parents who worked, played, and traveled for luxury sports car dealerships. At home, her doting grandmother cooked for and fed her, but it was her grandfather—an evening-gown designer, riveting storyteller, and bird expert—who was her mentor and dearest companion. But by the time Nikki graduated from college and moved to New York City, she was succumbing to alcohol and increasingly unable to care for her flock. When her grandfather died, guilt-ridden Nikki drank even more. In a last-ditch effort to honor her grandfather, she flew to France hoping to visit the bird market of Paris to release a white dove. Instead, something astonishing happened there that saved Nikki’s life.